Last Remaining Whiskies from Famed LaSalle Distillery Included to Create New Crown Royal XR. Inspired by a desire to provide whisky lovers with the perfect blend to celebrate life’s special moments responsibly, Crown Royal® today announced the second installment in the brand’s Extra Rare Whisky Series. The latest Crown Royal XR® blend includes select remaining whiskies from the renowned LaSalle Distillery in Quebec, Canadato create an unparalleled experience in luxury whisky. Crown Royal XR, including whiskies from the famous LaSalle Distillery, marks the second Extra Rare whisky for the brand after releasing the original, crafted from the Waterloo Distillery whiskies, in 2006. As part of this on-going Series, each Crown Royal XR blend will be created including a batch of rare whiskies and distributed for a limited time. Handcrafted by Crown Royal Master Blender Andrew MacKay, the new XR installment provides an extremely sophisticated tasting experience while maintaining the smooth undertones Crown Royal adorers have come to expect. 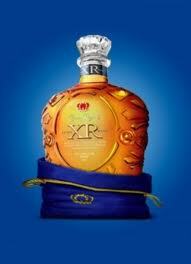 Crown Royal XR is topaz and amber in appearance, with elegant aromas of aged oak, caramel and vanilla. The 80 proof (40% ABV) whisky’s taste is a sophisticated blend of dried fruits and honey in a harmonious balance with the spicy notes of Canadian rye. For MacKay, the new installment of XR marks a personal legacy. The LaSalle Distillery, which opened in 1924, is where he began his career as an apprentice and refined his passion for blending whisky before ultimately taking on the title of Crown Royal Master Blender. LaSalle is also significant to Crown Royal, as it was the first distillery opened by the Bronfman family, a legendary name within the spirits industry. The Bronfmans were responsible for the creation of the original Crown Royal in 1939 to commemorate King George VI and Queen Elizabeth’s visit to Canada. Crown Royal XR will be available nationwide for a suggested retail price of $129.99 for a 750 ml bottle beginning in early June. As with the inaugural installment in the Extra Rare Whisky Series, the new Crown Royal XR will be available for a limited time. The Crown Royal XR packaging carries through the luxurious presentation established with the first installment in the Extra Rare Whisky Series. The unique bottle shape, deluxe glass stopper and iconic velvet bag will remain the same in shape and design, but will reflect a royal blue color to echo the regal nature of the product. The launch of Crown Royal XR will be supported through print and online advertising, as well as public relations, point of sale materials and a strong digital strategy. The Extra Rare whisky is best enjoyed neat or on the rocks, in order to allow the full flavor profile to emerge. When enjoying Crown Royal XR, please remember to always drink responsibly. Crown Royal Canadian whisky is the number one selling Canadian whisky brand in the US by value and has a tradition as long and distinctive as its taste. Specially blended to commemorate a grand tour of Canada made by King George VI and Queen Elizabeth of Great Britain in 1939, Crown Royal Canadian whisky’s smooth, elegant style reflects its aristocratic origins and is considered the epitome of Canadian whisky. For more information visit www.crownroyal.com. Crown Royal encourages all consumers to please enjoy responsibly. Diageo (Dee-AH-Gee-O) is the world’s leading premium drinks business with an outstanding collection of beverage alcohol brands across spirits, beer and wine. These brands include Johnnie Walker, Crown Royal, J&B, Windsor, Buchanan’s and Bushmills whiskies, Smirnoff, Ciroc and Ketel One vodkas, Baileys, Captain Morgan, Jose Cuervo, Tanqueray, Guinness, Beaulieu Vineyard and Sterling Vineyards Wines.